Above: Simon de Montfort, Chartes Cathedral. In January 1265 (the 20th, to be exact), England's first parliament in history met. The parliament was held until mid-March and was instigated by Simon de Montfort, who famously led the rebellion against King Henry III. Montfort is regarded today as one of the progenitors of modern parliamentary democracy by virtue of the fact that his parliament featured representatives of the shires and boroughs alongside the aristocracy and clergy. As Dominic Sandbrook notes, the 1265 parliament therefore 'posed a potent challenge to the king's monopoly of power'. Although Montfort cannot be termed a democrat in the modern sense of the word, he may potentially be seen 'as the accidental godfather of parliamentary democracy'. Following his victory over the king at the Battle of Lewes during the Second Barons' War, Montfort realised that he needed support from a range of groups: not just the knights and nobility, but the town burgesses too. Although Montfort was killed at the Battle of Evesham later that year, his decision to invite burgesses to parliament, alongside knights, was taken on board by Edward I upon his succession. This had become normal by the fourteenth-century, and the gathering had become known as the House of Commons. Thus, Montfort is regarded as the founder of the Commons. 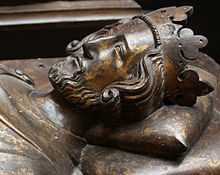 Above: Henry III, king of England from 1216 to 1272. In the words of historian F.W. Maitland, the events of January 1265 transformed parliament 'from an occasion into an institution'. As Nicholas Vincent explains: 'Parliament's authority rested upon popular respect. Should it lose that respect, even today, then it forfeits all authority'. Because of Montfort's actions, parliament can celebrate 750 years of debate. Historians have viewed the January 1265 parliament as a populist and tactical move on Montfort's behalf in an attempt to garner further support with which to strengthen his position: thus Jeffrey Hamilton describes this parliament as 'a very partisan assembly, not some sort of proto-democratic representative body'. Anachronism, then, needs to be avoided in analysing the nature of the 1265 parliament. The parliament was primarily concerned with enforcing the Provisions of Westminster, including placing restrictions on the nobility and promising judicial assistance to those suffering the unfairness of feudal lordship. In 1965, Parliament presented a loyal address to the British monarch, Elizabeth II, marking the 700th anniversary of Montfort's parliament. This year, Parliament planned a programme of events entitled "Parliament in the Making", including events to mark the 750th anniversary of the 1265 parliament. On 20 January 2015, "Democracy Day" was broadcast by the BBC to coincide with the 750th anniversary, consisting of live discussions and debate about the nature of parliamentary democracy. In all respects, then, the calling of the January 1265 parliament represented a turning point in English history. Parliament in thirteenth-century England was not the same as its twenty-first century equivalent, but Montfort's actions were unprecedented and helped to instil the principle of parliamentary democracy, which prevails to this day. Was Anne Boleyn A Modern Woman?